Would you be interested to find out those reliable and affordable Nigerian based web hosting providers with best features and customer support that allows you to pay in Nigerian Naira? If your answer is yes then you are just in the right place at the right time but before we proceed you must know that the cheapest is not always the best but being popular can be attributed to how good a web hosting is, in other words, it shows they have something valuable to offer or maybe they have a big pocket to market their brand in a special way to attract more customers who knows. Finding a reliable good web hosting that offers you what you want at your desired price is not an easy task especially when you have not used any of them to know how good and reliable they are but I have used a few different web hosting providers since 2012 and I am here to guide you and explain certain things you need to know about web hosting. Last time i wrote some related post you might be interested to check out 2018 Nigeria best web hosting, Local and Foreign hosting and 8 Cheapest web hosting providers in Nigeria (Pay in Naira) but we are in 2019 and a lot has changed that is why I hard to provide something fresh and current regarding to Nigerian web hosting providers. Now you know why we are here and if this content is not for you then you might be happy to check other great content here on our webmaster's category. This might not be important to many bloggers because they already know what a web hosting means and how it works but for those who are not familiar with the term web hosting still have the right to know what we are talking about and to make it simple a Web hosts are companies that provide space on a server owned or leased for use by clients, as well as providing Internet connectivity, typically in a data center. Every website/blogs have a web hosting where all the data such as design, structure and all the content are being stored and made accessible for end users. To create a website apart from other free platforms such as blogger and wordpress.com, you need a web hosting and domain name, while the web hosting stores and makes the necessary data accessible, the domain name serves as an identity. A domain name is just like your name, people call and recognize you by your name, when someone mentions your name you will react just the way a web hosting react when a domain name is typed on the URL address bar, it will connect, retrieve and preset the requested content, to make it more understandable xtremeloaded.com is the domain name of this website no other website in this world can bear the same name at the same time. When it comes to web hosting our desire differs but still, there are more important features you should not ignore when looking for a good web hosting provider but yes for different people there is a different definition of being good but I will tell you what I value most and how I consider a good Webhosting. How long can your web hosting server stay without clashing, how stable is your server and how fast does it respond to a request, these are the most important question to ask because I have used a Webhosting that used to clash every hour and comes up the next minute and yet they advertise 99% uptime guaranteed on their website. Apart from uptime, you need your web property on a fast stable server because even a slow server can be detrimental to your search engine ranking. I left one of my favorite hosting provider in 2016 because they are not always available to assist me when I need them most and to use a Webhosting provider that doesn't have live chat support is a no go area for me, only email support will not be convenient for me because some issues require urgent attention. In this case, you need to be sure of what you need, I hate to pay more for expensive hosting plans while you actually need a lesser plan that will cost less and still offer you the value and services you require. To spend your money wisely you might need to evaluate your traffic and data to be able to know exactly how much bandwidth and disk space you need but to be on a safer side start with cheap plans and upgrades when the need arise. Different web hosting offers different features and you need to dig deep to find the one that offers what you need and also allows you to increase your data storage space, allocated bandwidth size etc. There are other things you might need to consider when looking for a web hosting but I will stop here for now since we have other things to discuss. Before listing most of the web hosting that Nigerians use to power their website I believe you will love to know those ones I have used and currently using right now. If you are interested to know the web hosting that I am using then Namecheap is currently the one am using now and am having a great experience with them especially when it comes to their support, they are always available to help irrespective of the time or your location. Their server is fast but I do have some occasional server error but overall I am very happy with them because they are affordable and offers real value for money. As I said earlier the cheapest is not always the best and if you ask me to tell you the best web hosting I have ever used I will boldly tell you Inmotion Hosting, they are the only hosting I have used for more than 1 year without noticing any downtime and they are always available to assist me at any point in time. I left them because their hosting is not affordable compared to Namecheap and I had a great offer that will help me reduce the hosting cost, by the way, if I don't test different hosting providers how can I tell you how good they are but if you are searching for the best web hosting that will give you peace of mind then try Inmotion hosting. If you check well I don't discuss anything about web hosting without mentioning web4africa because that is where I started my journey, they are the first web hosting I used to power xtremeloaded.com back then in 2012 until I decided to move on. I love them because their support was excellent and every other thing is good until they decide to make some negative changes that I cannot except but if your website visitor is manly Nigerians then you might have some good reason to use them because they have data centers in South African and Nigerian which means that Nigerian visitors will experience good speed compared to other visitors from other regions. I intend to use other Webhosting providers to find out how they work in the future but for now, I only have Namecheap, Inmotion and web4affrica in my list. Am sure you have been waiting for this list but you don't need to wait any longer as am ready to show you the Most Popular & Cheapest Web hosting in Nigeria. All the web hosting I will list here are those that fully accept Nigerian currency (Naira) and below are the list of top and cheapest web hosting providers powering thousands of Nigerian websites and blogs. 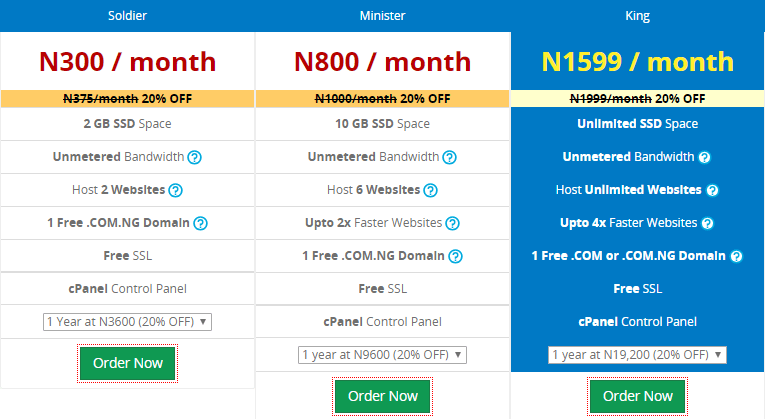 Hub8 Hosting is currently among the cheapest web hosting in Nigeria that offers you more value for your money and if you are looking for a place to get started then try Hub8 hosting starting from ₦2,500 one year (20% discount), above all they also have free limited hosting plan you can use completely free without paying for anything plus free domain name but with limited resources available. You also don't need to worry about converting naira to a dollar in other to pay for your web hosting as they fully accept Nigerian Naira. Web4afria offers you the opportunity to have a web hosting with a data center in Nigeria and South Africa which reduced data latency and improves speed. They design a portal made for their Nigerian customers at web4africa.ng that allows you to easily register and pay in Nigerian Naira using your ATM MasterCard, Visa, or Verve cards. If you are interested to find a web hosting with a data center in Nigeria close to your audience, or a web hosting that allows you to pay in Nigerian Naira then you can try web4afria. Whogohost is among the most popular and affordable Nigerian based web hosting that allows you to pay for your hosting and domain name registration in Naira, through bank deposit and online payment. 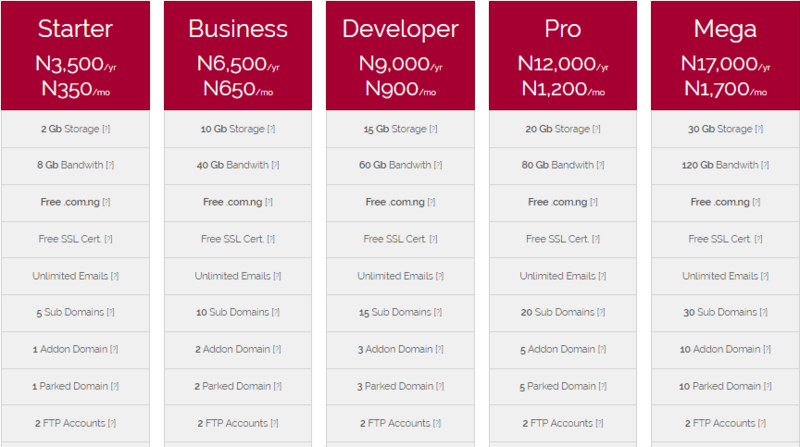 They have a variety of plans that will suit your need and their shared hosting plan starts from N4000 annually (Yearly) which includes free .ng domain, free SSL certificate and lots more. Smartweb hosting is another Nigerian base web hosting provider that allows Nigerians to choose from their various hosting packages and pay in Naira. 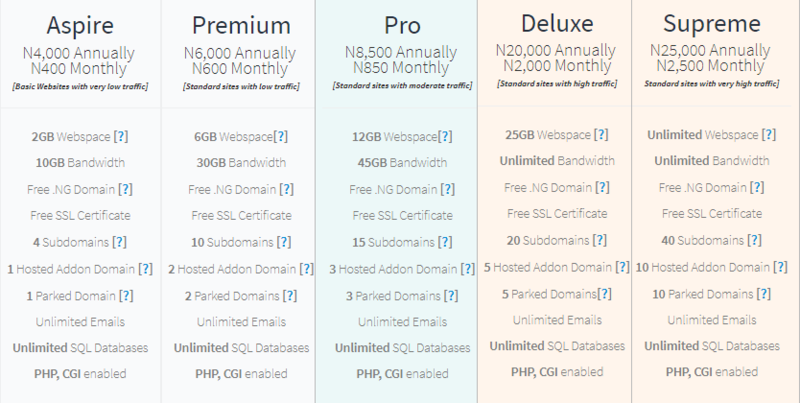 They have different shared hosting packages namely, Standard, Business, Premium, Corporate and Professional package starting from ₦3,500 per year while their professional Linux plan starts from ₦50,000 per year for multiple and heavy traffic websites and blogs. Q servers web hosting is a great Nigerian web hosting provider you might be interested to try because they offer you the real scalability, great features, excellent customer support, daily and weekly remote backups. They have more than 12 years experience in terms of web hosting services and allows you to pay in local currency using your debits card or through direct bank deposit. To serve you better they have different hosting plans for different purposes starting from ₦3,500 per year while their highest shared plan is ₦17,000 per year which is still low compared to others. Surfweb is among the Nigerian base web hosting offering between a basic hosting plan that starts from ₦3,000 per year to unlimited plans at the rate of ₦56,500 per year. 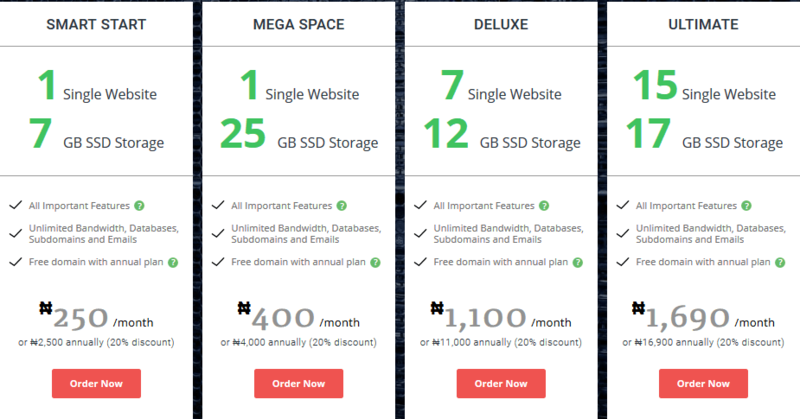 Whether you are just starting or have a heavy traffic website, you are covered because there are suitable hosting packages for you to choose from and yet you don't need your bank to convert your naira to dollar at their desired rate when paying for your hosting services since you are free to pay in Nigerian naira just like other Nigerian based web hosting that I have mentioned on this page. It will be an injustice if I don't mention Hostnownow which has been existing for many years powering thousands of Nigerian low, medium and high traffic websites as they offer different hosting packages starting from ₦2,500 per year. When you join Hostnownow you will enjoy certain benefits which include Free com.ng, org.ng, net.ng Domains, free SSL, Unlimited E-mails and premium support as they are always available to help you when necessary. Domainking is a popular domain name and web hosting provider in Nigeria and this list will not be complete without including them as one of the most popular and cheapest web hosting in Nigeria. They have 3 good hosting plan to choose from and as well offers unlimited bandwidth on their Soldier plan which is their cheapest hosting package that only cost ₦3,600 per year with a free .com.ng domain name, free SSL and lots more.